I’m changing it up a bit for this week’s post, Mutineers, and setting aside the wax gems for flesh-and-blood. I think auntie netta is getting to my head-a, cuz I’ve got Jaffna on my mind. 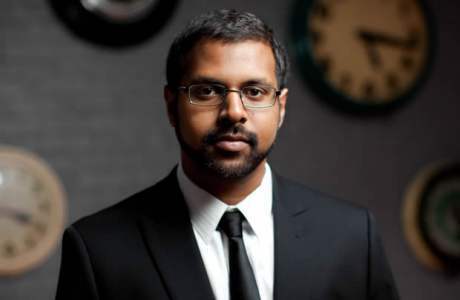 I’d like to focus on a certain young, hot, and hip Tamil artist with politically charged lyrics, plenty of street cred, and an original and inimitable sound. If you are expecting to see gaudy glasses, gold tights, or…whatever this is, well, you are wrong. This Sri Lankan sensation unpretentiously rocks wire frames, loose jeans, and a 5 o’ clock shadow that magically morphs into an uncle-ji stache. 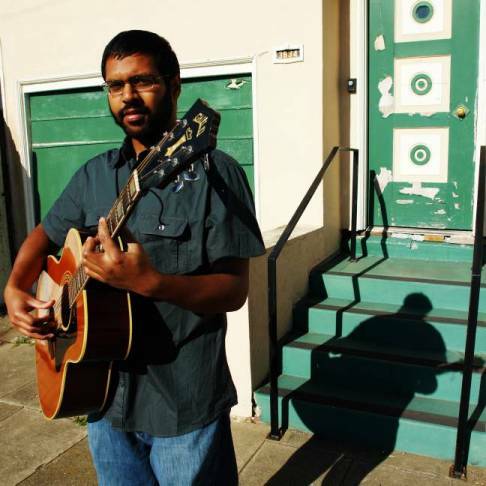 I’d like to introduce to the Mutiny my favorite discovery of 2010 and your new folk hero, Bhi Bhiman. I have a lot of records. Not more than the KGB of course, (that nonsensical distinction is for MIA alone to lay claim to) but enough to have seriously impacted my pocketbook, personal life, and also to provide me with an escape when pressures of living with wackily overbearing desi parents prove to be a bit much. I started collecting in 2000, a year before the first generation iPod was first released (partially designed by my friend’s dad while we were still in high school, no less). Since then, I’ve accumulated probably close to 1000 records but, to this day, my audiophilia never translated into me owning an iPod or any other personal mp3 player. The reason is simple- those devices offer the exact opposite experience to that of the LP. The record is a tactile medium and it is almost not possible for the music to be seen and felt as much as heard, a reality totally lost with the iPod. The mp3 player certainly provides incredible convenience and portability for those who want hours of tunes at their disposal without a wheel-barrow to schlep it around in, but I’ve found that it deracinates and decontextualizes the music from the interesting history and processes that helped created it. It’s in the spirit of this obsessive nerdery that I came across, via reading the miscellanea on my record sleeves, the subjects of tonight’s post and the nuggets I’ll be sharing every Friday with all ye Mutiny Faithful. This week’s nugget is a soon-to-be-legendary gem of a track that I’ve spent over 3 years trying to dig up before finally tracking down a copy in a warehouse in Delhi. It was mine (and mine alone!) to enjoy until I foolishly informed Manish of this magical slice of audio heaven at a party last March. I guess if I’m going to have to share it with him, I might as well introduce you guys to your new favorite summer jam. A dark wheatish figure finally opens the bunker door. “Sometimes,” you quip. He doesn’t get the reference. Smiling, you enter.